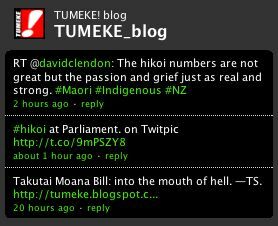 The hikoi has reached parliament and I hope Hone is making the most of it. [The Hikoi was] met by several MPs including Maori Party co-leader Tariana Turia, Attorney-General Chris Finlayson, Greens co-leader Metiria Turei, Labour's Shane Jones and Parekura Horomia, and independent MP Hone Harawira. Afterwards, Mr Harawira said he had been moved by the hikoi, even though it was a fraction of the size of the 20,000-strong hikoi that protested against the 2004 legislation. "I would expect even my erstwhile colleagues in the Maori Party [would have felt] a sense of the pain in the gathering today." Mr Harawira said the tangi was held to "return the pain". "They were laying down the Maori Party flag, I think, because they had a sense it was the Maori Party that was here in 2004, but sadly the Maori Party is also party to this bill. 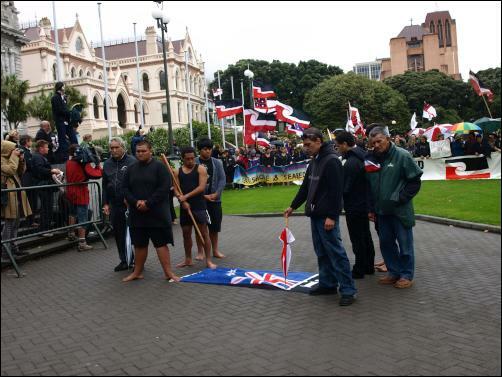 They were laying down the NZ flag on top of the Maori flag to remind us how dominating, still, that is. "They were laying down those acts because those brought pain to Maoridom right across the country." He said the smaller numbers of the hikoi could be because it was hard for Maori to march against Maori. Mr Finlayson described the hikoi as very respectful, and "very small". It would not make a difference to the bill, he said, which is going through its committee stages and is expected to pass by the end of the week. When asked what he got out of the hikoi, Mr Finlayson said: "I got wet". Mr Harawira said Mr Finlayson did not understand Maori. "He has no interest in Maori tikanga (customs), he has no interest in Maori kaupapa (concepts and principles)." Earlier, Mrs Turei revealed Justice Ministry advice that said the bill created a double standard, because it excluded the parts of the foreshore and seabed that were already privately owned. It doesn't look like the numbers will be enough to sway the Mational party in and of itself, but that group huddled in what looks like bleak conditions on the parliamentary grounds are the tip of a very wide and deep section of the Maori constituency opposed to the continued operation of a confiscation and is representative of opinion across all classes of Maori and the views of Maori organisations. A) The Maori Party caucus passing the bill against their own constituents' interests and consent. Result: MP lose a minimum of two and perhaps three or even all of their seats in the backlash. The party vote numbers will flow from MP to Hone's new party, Green and Labour and that could mean one or two more anti-Nat MPs in the House. Without the MP numbers behind Turia National is in weaker position than it otherwise would be come 27 November. 2. MP and National will resume debate on Takutai Moana issue when Rahui Katene's private members bill on repeal of the 2004 Act comes up in May - which is sitting in the background acting as the backstop option. National's Marine and Coastal bill - or what is left of it after a different bill is passed - could then be used as the basis for Katene's repeal bill if she agreed to make it a government bill - perhaps under a MP minister's reigns, or back with Finlayson. Result: MP may still lose Te Tai Tonga if Katene is not seen to have redeemed herself for supporting National's original bill, and with that same proviso so Sharples and Flavell will also be in stronger positions than if they had passed the original bill. National would thus be in a better position. Every vote that flows back to the Maori Party as far as National is concerned is a vote for a National-led government (especially now that Hone has been shown the door). Every red neck vote gained by Act if the legislative process drags closer to the election will not harm National in the sense every vote from National to Act is still a tick for a National-led government. There seems more to be gained by finding a way out and through than keeping an unconscionable bargain the result of which is mutual destruction. 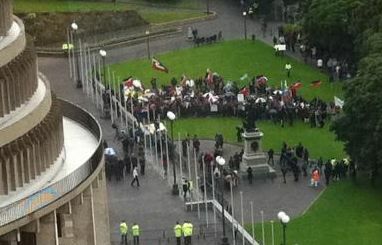 but that group huddled in what looks like bleak conditions on the parliamentary grounds are the tip of a very wide and deep section of the Maori constituency opposed to the continued operation of a confiscation and is representative of opinion across all classes of Maori and the views of Maori organisations. How many were at the first Hikoi and how many were at this one? Bit of a shocker that one when you think about it. They are banking on no-one thinking about it, just how no-one - no white man anyway - in the Waikato or the Bay of Plenty or South Auckland thinks about the fact they are part of a scheme to occupy confiscated Maori land for the purposes of supressing Maori authority. The hikoi in 2004 was anger and protest, but this hikoi against the bill and hence against the caucus of the Maori Party, is more grief and dismay. This reflects the general feeling. It is not registering publicly because the result of disappointment and dismay is that the Maori Party supporters lose faith and withhold support rather than actively supporting another party. You aren't going to see this because its a non-action. Rather than have a public scrap it is just easier to let your membership lapse and not return calls - that's how it happens. It's an organisation not worth working for and worth anyone's time. No-one worth knowing will offer decent advice, no-one to organise the meetings, no-one to put up the billboards, no-one to give donations, no-one to scrutineer, no-one to wave the flag. People will be attracted to staunch and independent candidates, that's how NZ First swept in and why they were swept out too. It is why Hone ought to sweep in in his electorate. The old sell-out candidates will fold against a half decent candidate. Shane Jones in Tamaki Makaurau will be looking a good bet to oust Sharples. Katene is goneoskiburger. Flavell is toast too if he can't even maintain support in Rotorua. Mr Selwyn what is the feeling at the branch level re Maori Party? Will they forgive and still give Maori Party their vote or will Labour pick up on the genuine economic pain many Maori are feeling? Would this feeling see a slump in the Maori Party hold on the electorate seats? I don't see how anyone can forgive - people are already walking away. People feel sick and heart-broken and embarassed. 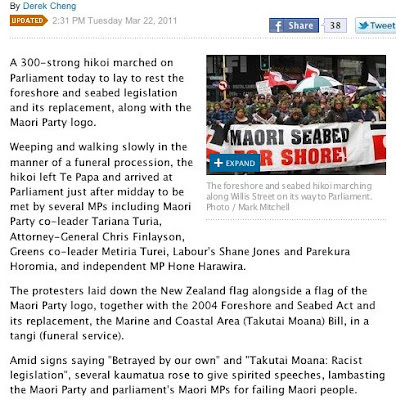 People were proud to fly Maori Party flags from their cars - no-one would even imagine doing that now. Members have been chucking it in since this sell-out became apparent and it will escalate. There isn't going to be enough time before the election to salvage anything and English's budget will be so tight he won't be able to give any money to the MPs flagship policies like Whanau Ora. Privatisation of prisons (Sharples bag) is no sort of policy victory either. Turia et al. have backed themselves into National's corner and a vote for the MP is a vote for National - the Maori electorates despise National on the best of days - so why on Earth would a Maori voter vote for National's proxy... they won't. Mr Selwyn - who will benefit from this malaise? Some say Maoris are not even indigenous to NZ - they come from east polynesia and brought slavery and cannabilism to NZ. Is that right? They have no rights to the foreshore and seabed. Turiana and Pita certainly look like they came from somewhere else? Fonganui, perhaps?